Dear fellow freelancers! 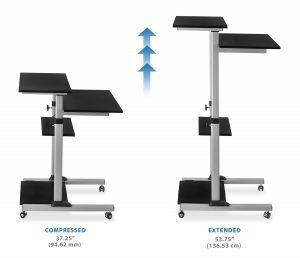 Have you started looking into getting yourself a height adjustable standing desk but aren’t 100% sure what you should be looking for? Maybe you’re a bit overwhelmed by the options. That’s perfectly ok. I’ve got you covered. I’m going to bring you 5 budget-friendly, perfect height adjustable standing desks for any sized home office. 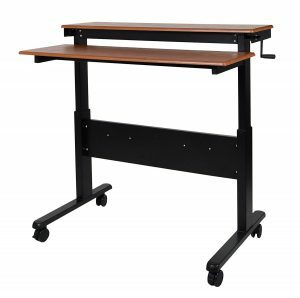 First, take a look at my article, Height Adjustable Standing Desk – What to look for when you buy to see what it is you should personally be looking for. *Remember, the min/max height should be the height of your elbow when you’re working. (maybe an inch or two lower than your elbow if you count your keyboard). Buy now for just $199! So, obviously for this price range, you’re not going to be getting a perfect sit-stand desk, but it could be great to test out to see if you even like standing and working before splurging on something more pricey. 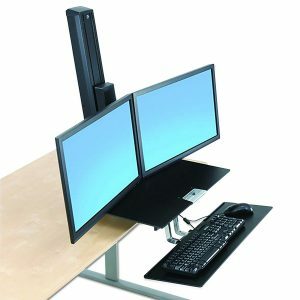 Many of the reviews say that if you use two monitors, then you’ll actually have to do some of the lifting because the springs aren’t strong enough to lift both. Unfortunately, that small inconvenience might mean that you won’t raise it and stand up as much as you should. 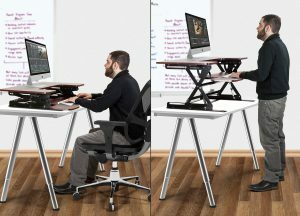 However, this is a great introductory product if you’re not quite convinced about standing desks. There are other, cheaper models but this one, I believe, has the best cost/benefit in this price range. Less than 200$ on something that most freelancers will use 6-10 hours a day is a pretty sweet deal! 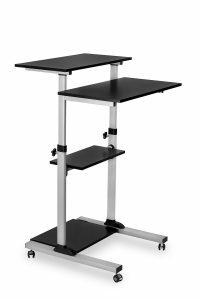 Ergotron is a very well known name in Sit-stand desks converters, and this design is perfect for small spaces. It clamps onto the front of your desk and moves up and down with a smooth lever. The keyboard tray and workspace can be folded if you need your desk space back. At $405 it might seem a bit pricey, but if it’s something that you’re going to use day in and day out for a few years, and you don’t have space for something bigger, then I’d say it’s more than worth it. This is a great budget-friendly and mobile, height adjustable standing desk. There are obviously some things that could be improved on it, but overall talk seems to be very positive, especially if you have a small space and would like to be able to move your desk from one place to another. Once again, be careful if you’re short (5’3″) or tall (6’3) because it may not work for you. Take a look at the minimum and maximum height before you buy! The one main flaw that I see is the crank. If you don’t mind spending a minute and a half cranking away 60 or 70 times on your desk, then you’re good to go. However, if you want to stand every 30 minutes or so (as you should), then this might be a pain. Another comment said that cranking while talking on the phone was neither comfortable or advisable. This would be a great option if you’re looking to buy a budget-friendly full desk though. If you’re really cramped in your home office (or don’t actually have one), this height adjustable standing desk might be great for you. Unfortunately, sitting at it would be a bit awkward. If you don’t work for hours on end or would like to set up your laptop and a Bluetooth keyboard/mouse combo here, that would be perfect. If your job requires you to make phone calls or you just want to check some emails quickly, this workstation would be perfect for you. However, if you need to have a full desk where you sit and work for hours on end, this option probably isn’t for you. One of the more complete desks would work better. This is a specific model for very very tight spaces! This desk, for the price and what you get, is the best thing out there. Are there better desks out there? Maybe. 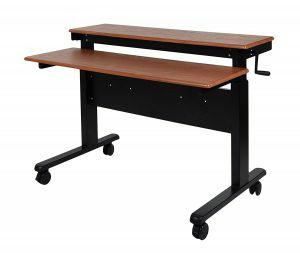 Are there desks out there with a better cost/benefit? I don’t think so. This desk comes with dual motors and a memory control remote. That means, all you have to do is push the right number, and the desk automatically moves to the position you’ve set it at. The motor is quiet, and it’s all easy to set up (less than 30 min). 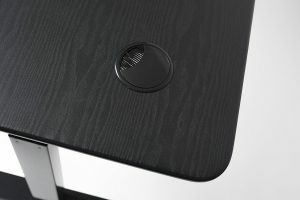 The legs are made out of steel, and the top has a nice rounded front which lets you get closer to your keyboard, so you don’t have to stretch out. 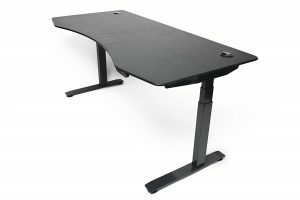 If you have the room for a full desk and would like something that goes up and down on its own for a couple hundred more than a crank desk, this ApexDesk is the option for you. Many desks this style are well above $1,000. This is the perfect desk for any freelancer who’s looking to be more health conscious and take care of there body in the coming year. So, there you guys have them. 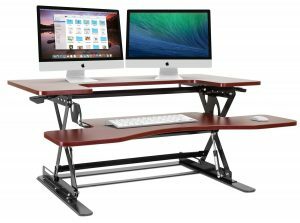 The top 5 height adjustable standing desks for different budgets and home office spaces. 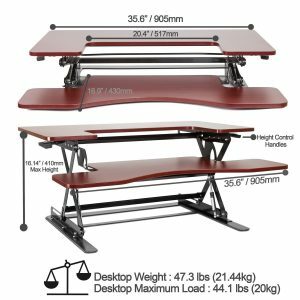 If you do happen to get yourself one you should also check out my article about the proper use of height adjustable standing desks. It seems to be a common theme that these desks don’t work for taller or shorter people but I guess manufacturers have to play towards the masses. Just make sure you check the minimum and maximum heights before you buy. If you buy one, open it, assemble it and find out it doesn’ work for you, it could really be a pain to return it (although it can be done). Have you guys bought a height-adjustable standing desk? Which one did you get? Would you recommend it? I was surprised that you really have desks which can used while sitting as well as while standing by adjusting the height according to your convenience. It could solve the complaint of sitting too long while working. I like the Halter ED-258 because if one monitor is used lifting could become easier. Nice website with good pictures. Hey! I appreciate you taking the time to leave a comment. These are definitely perfect for solving that complaint of sitting too long. You can still be productive while relieving aches and pains when you stand up after hours of sitting and working. I hope you find one that works for you! 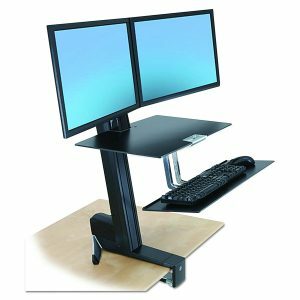 It is really great know some best quality height adjustable desks. You have done a very good review. Height adjustment desk is very useful for people who mostly work on their computers. Looking forward to have one such great desk for my home too. I’m glad you could find something useful. Having a desk where you can both sit and stand would very beneficial to your health, especially if you ever experience back pain or stiffness from sitting too long. Remember, when you click on the links it will take you directly to the Amazon page for that item so you don’t have to go searching for it. Good luck and Happy Freelancing! Looking at these options for someone like myself, a tall person who works in a small space, the Mount It! Mobile Stand Up Desk looks like the best option. I work with a chromebook and no mouse so I don’t need much space and I think I could probably sit at it without too much trouble… er, how wide is it? Unfortunately, depending on how tall you are options can be pretty limited. I’m 6’3″ and find that most electric standing desks just barely reach a good ergonomic height for me. Also, when most standing desks are at their fullest height they seem to wobble a bit more as well. However, it’s not the end of the world and I love my standing desk. The Mount it! Desk is 23.5″ wide at the base and the keyboard and monitor shelf are both 27.5″ wide. It’s also 26″ from the front wheel to the back. In order to be ergonomically sound you should actually probably have a Bluetooth keyboard and mouse on the lower shelf. In my article: How to Help Lower Back Pain – 5 Habits to Change your Life There’s a great visual that shows you exactly how you set up should be based on your height. I hope that helps and thank you for stopping by! Good luck and Happy Freelancing! I have a Halter in my home office and I can’t say enough good things about it. It fits perfectly in my office space, and even though it was pretty budget friendly, it doesn’t look cheap. I don’t feel embarrassed when a client comes to my home office. It seems like it will last for many years to come, and I would definitely buy it again. That’s the exact thing that I’ve come to understand about it. It really is a steal! I’ve got a Flexispot electric standing desk and it’s one of the best purchases I’ve ever made! Thank you for stopping by and if you ever have any questions give me a shout. Happy Freelancing!